Recent Uprising Among the Bannock Indians. 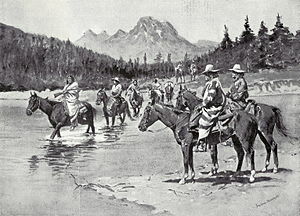 A Hunting Party Fording the Snake River Southwest of the Three Tetons. This event should not be confused with the Bannock War of 1878. The Bannock War of 1895, or the Bannock Uprising, refers to a minor conflict centered around Jackson's Hole, Wyoming, in the United States. During the early 1890s Wyoming passed a state law prohibiting the killing of elk for their teeth, which led to the arrests of several Bannock hunters in 1895. The arrests, and the death of one Bannock, created wildly exaggerated rumors that the natives would revolt, and the Eastern press reported that the Bannocks had massacred a large group of settlers in Jackson's Hole. In response the United States Army launched an expedition into the area, but when troops arrived it was found that the situation was peaceful and the fears of uprising were unjustified. In the late 1800s and early 1900s the use of elk teeth for jewelry became popular in the United States. This led to the belief that the elk in and around Jackson's Hole would become extinct due to poachers who would kill the animals solely for their teeth. So in the early 1890s the Wyoming Legislature passed an act making it illegal to kill an elk wantonly. By 1895 Jackson's Hole was becoming a popular destination for big game hunters who felt the local Bannock hunters were interfering with their sport. Elk was a main food source for the Bannocks, who lived on Fort Hall Reservation across the border in Idaho. In July 1895 a party of Bannock hunters was arrested, for violating the poaching act, by a posse of eight men led by Constable William Manning. A little later, near Cora, Wyoming, six more Bannocks were detained but they were released by the townspeople who couldn't afford to feed the prisoners. Shortly after that, an old blind native was killed in some way along Hoback Creek and nine others were arrested for poaching by Justice of the Peace Frank H. Rhodes. Rhodes, in his telegraph report, issued to Constable Manning, said; "Nine Indians arrested, one killed, others escaped. Many Indians reported here: threaten lives and property. Settlers are moving their families away. Want protection immediately. Action on your part is absolutely necessary." Once news of the incident reached the public, exaggerated reports made their way to the East Coast where finally a New York newspaper claimed that all of the settlers in Jackson's Hole had been massacred by the Bannocks. The headline on July 27 of the Maryland newspaper "Baltimore Morning Herald" read: "Butchered by Bannocks - An Awful Massacre at Jackson's Hole. - TROOPS ARE TOO LATE. - Men, Women and Children Killed. - NOT ONE ESCAPED." The newspaper went on to say that "[t]here is no doubt that the redskins have fired every home and cabin and by morning they will be repeating their work [in Idaho]." The source for the claim was three fisherman who said that "every man, woman and child in Jackson's Hole [was] murdered." In an earlier article the "Baltimore Morning Herald" stated that their source, a mail carrier from Star Valley, said that the Bannocks had blocked off the passes leading into Jackson's Hole and that the residents within the area were all fleeing for their lives. 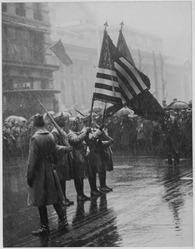 In response to these claims the United States Army sent troops into the region with orders to occupy Jackson, Wyoming. Most were unable to traverse Teton Pass but one company of Buffalo Soldiers managed to descend the slopes on their wagons with ropes. However, when the soldiers entered they found no Bannocks, no dead citizens or a fire, proving that the whole situation was far different from what the newspapers were reporting. The Indian agent at Fort Hall telegraphed the following; "All Indians absent from reservation has returned. Had big council. Requested me to telegraph you their hearts felt good. Had not harmed a white man, and would start haying, leaving their grievances to the justice of the white man." The Bannock hunter Race Horse, one of those arrested for poaching, was taken to the District Court in Cheyenne to be charged, but the court held that the poaching law was superseded by the Treaty of Fort Bridger. The case then went to the Supreme Court which concluded that Bannock people were void of the poaching laws on reservation land. So the charges against Race Horse were dropped and he was released, marking the end of the second Bannock War.